Erica Leimahinaanue Pilotin is currently a senior in the class of 2018 at Seabury Hall on Maui, Hawaii. Pilotin first came to Seabury Hall in sixth grade while her older sister, Emma, was already attending the school. 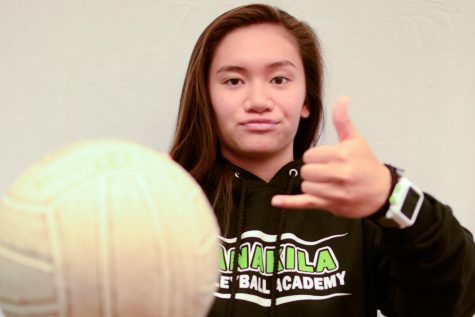 She is the captain of Seabury’s girls volleyball varsity team, and she also used to play for Lanakila Volleyball Academy. Pilotin enjoys art classes. She says she likes art because it’s nice to physically do things instead of just learning things. She also enjoys thinking about quantum physics and scientific theories, such as black holes and how the universe works. In her free time, she likes to surf and hang out with her friends. She likes catching up with TV shows, like “Game of Thrones.” She is planning on attending college after high school, and she is interested in studying architecture. As a young girl, Pilotin really liked to play with Legos and build structures with them. Because her Dad is in construction, he would pretend to help her design buildings/structures. Pilotin has been into designing and building things since she was a little girl. She says that she can grasp the concept of something that she is learning better when she is working with her hands. One of Pilotin’s goals that she wants to achieve is to someday be living on her own with enough income to be able to give back to her parents and family.